While you wouldn't know it by its title, The Inpatient serves as a VR prequel to 2015's Until Dawn. While your enjoyment of the title isn't fully dependent on having played the original, the backstory and lore built around the game is marginally enhanced if you have. Where Supermassive Games delivered a polished and incredible VR experience with Rush of Blood, which is another title in the Until Dawn series, The Inpatient feels lacking in nearly every aspect of narrative, game design, and function. While the appeal of a game like The Inpatient is built around a choose-your-own-adventure hook, you'll struggle to want to replay it due to its painful controls and motion tracking systems. The story takes place in 1952, in the Blackwood Pines Sanitorium, a location known to those familiar with the series. While the game does hint at what is going on around you, it does in some ways expect that you know at least a little bit about the events that took place back then. You play as an amnesiac who begins the game with no clue as to who they are or why they are there. While that answer does unfold throughout the 2-3 hours a single playthrough will take you, the answer isn't particularly exciting. You'll begin this adventure through a few brief moments in your room, alongside a fellow patient who will be the same gender you pick at the start of the game. Eventually, all hell breaks loose and it's not long before you'll break free of your room and start to explore the Sanitorium and look for answers as to what is going on. While you can explore the Sanitorium, it will be in a very minimalistic and linear fashion. Several areas are entirely closed off, almost every door is locked, and there are remarkably few objects or locations to fully interact with. These sections are indicated by a glow of light and will usually trigger some sort of flashback that will reveal bits and pieces about who you are and how you came to be there. There are also several moments where you'll be stuck in place, unable to move, mostly just reacting or watching scenes unfold in front of you. 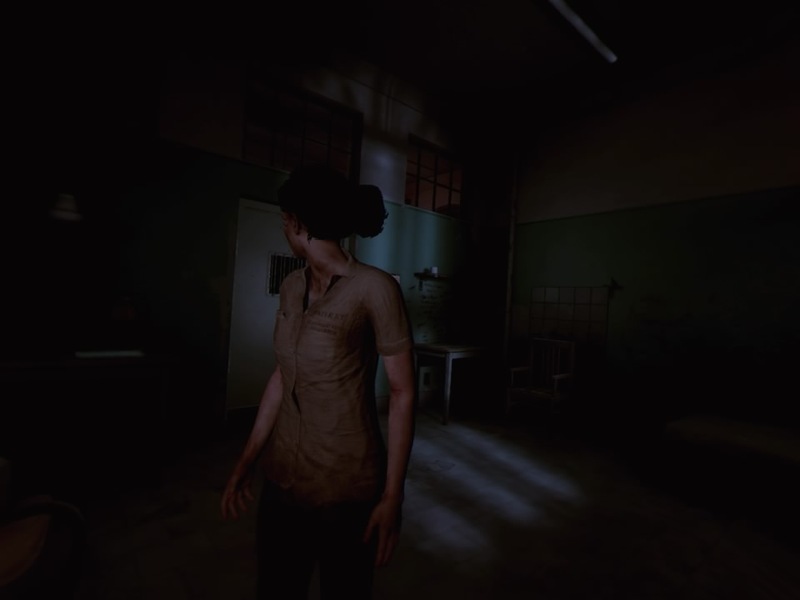 Combine that with several long stretches of just walking uneventful dark hallways with a flashlight, and The Inpatient feels far more like a VR walking simulator than anything else. You'll meet and interact with a very small cast of characters, with not a single one standing out in any way shape or form. Where Until Dawn entertained us with a solid cast of memorable characters, nearly everyone here is forgettable the moment the credits rolled. While I may have to look further into it, It seems like the orderly at the start of the game has their model lifted directly from another Supermassive Games title, Hidden Agenda. The one aspect that The Inpatient excels over the original is interacting with the cast via your voice. Since there is a microphone built into the VR headset, you can voice your dialogue choices when responding to the few characters the game presents to you. It's one of the few mechanics of the game that works as intended. These interactions and dialogue options will create variations in the story and The Inpatient, much like Until Dawn, has branching paths depending on those choices. Characters can live or die, stay behind, or begin not to trust you, all depending on your actions. While this can create a sense of replayability, all my choices during my two playthroughs took me to the same places, talking to the same people and ending up in the same final room. Sure, the outcome of my story was different, but it didn't feel different. While you can play with either the Dual Shock 4 or a pair of Move Controllers, neither setup seems up to the task to create a satisfying experience. I constantly had to resync the camera and my Dual Shock 4 almost every few minutes as the flashlight would position itself where I had to commit to some controller gymnastics to hold the damn thing right, or in the case of the Move Controllers, I had to hold the wand literally upside down for it to focus the flashlight directly in front of me. While that fixed my flashlight issues with the Move Controller, it also made my arm look twisted around and broken. I also had several issues with the game shifting my in-game body way out in front of me, forcing me to resync yet again. My troubles didn't end there as during my second playthrough, my in-game body turned permanently to the left and I had to reset my whole PSVR via the PS4 menu. While I could blame my PlayStation Camera for many of those issues, I immediately loaded up PSVR's Raw Data for a few hours and it worked flawlessly, so I'm not sure where the issue is. The Inpatient suffers from very clunky controls and neither setup tends to make them work any better. Your character can only move forward, to the side, or towards the direction you are facing. You can move the camera left or right with either the right analog stick on the Dual Shock 4 or by moving the right Move Controller around and pressing a button to snap the camera left or right. You can adjust it to have a bit more freedom but keep in mind that free movement in VR can cause motion sickness as it comes with a slight blur when it moves. What is puzzling is that you cannot move backwards and while that is somewhat fixed with a 180-degree turn, it can make positioning a chore when you simply just want to move a small distance. With the right Move Controller, you can point the wand behind you to do the 180-degree turn, but why you couldn't do that with the left wand to move backwards, is beyond me. The game also suffers from an onslaught of fade-to-blacks that while are at first used to transition between standing and sitting, start to work their way into breaking up scenes altogether. I'm not sure if these are loading screens in disguise, but they can cause your controllers to lose sync should you move your controllers during these fade-outs. I would say that during my 2-3 hours with each playthrough, I must have had to resync my gear at least 20-25 times. It's the only VR title I own where I have had to resync that many times. As I've mentioned previously, The Inpatient should run you around 2-3 hours on a single playthrough, with each following completion placed at around the 2-hour mark. Since there isn't really a whole lot of game to explore on your own, there really isn't anything here that is going to make this a longer experience, other than replaying it to see each and every conversation or outcome. If the game was priced around $20 then I could say it has enough value for that price, but it's more than double that and just doesn't feel worth it. The game gets to a point where the story starts to get far more interesting and then it just ends, a bit too abruptly for my tastes. On my first playthrough, I sat there in disbelief as the credits rolled, wondering what the hell had just happened. It didn't feel like an ending and even my "good" ending didn't feel satisfying. If you've watched a trailer or seen the screenshots that Supermassive Games have given to press outlets, then you are being misled. The game doesn't look near as clean or as visually gorgeous as the marketing would indicate. Characters and your environments are plagued by poor aliasing that is noticeable everywhere. In both my playthroughs I had several glitches with the Nurse talking but no dialogue or characters twitching or just moments of some really stiff animation. 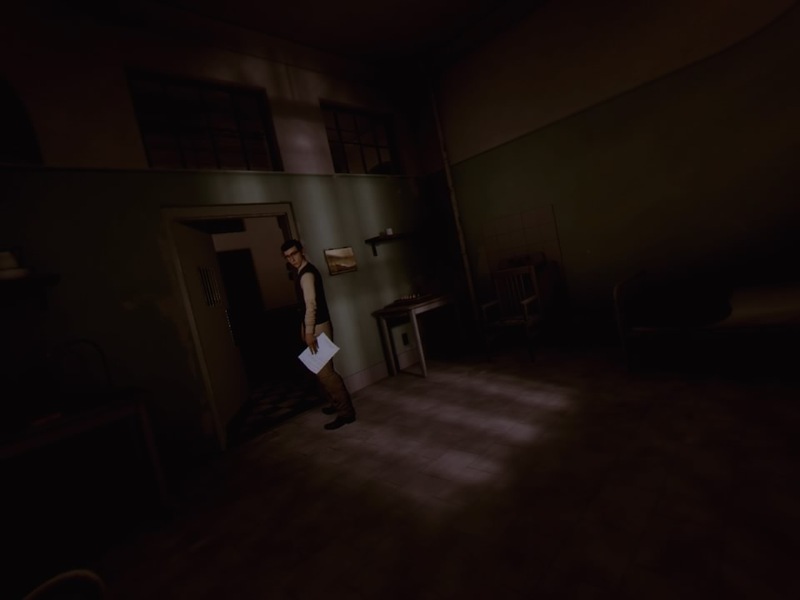 Much of the game is blanketed in darkness as while the flashlight helps, the game is just far too dark despite that being a staple of the horror genre. Many assets are used over and over and you'll see the same marks on walls or pipes several times over and apart from a small stint of going outside, you'll be walking a small handful of the same hallways over and over again. Supermassive Games had a great debut with Until Dawn and its VR cousin Rush of Blood. The production values for those titles are fantastic and both serve as strong games in their own right. The Inpatient feels more like an unfinished tech demo or a glimpse at a future project. VR can be a tool used to create a deep sense of immersion, but the clunky controls and poor motion tracking just pull you out of what the game is trying to do. There are a few solid scares here that are well designed, but apart from those moments, the game just suffers from a severe lack of varied content. While yes, the choose-your-own-adventure mechanic does allow for variations in the story, but you never feel as though these changes are affecting the main narrative. Their previous title, Hidden Agenda, did a better job at this type of system and made for a far more entertaining time. 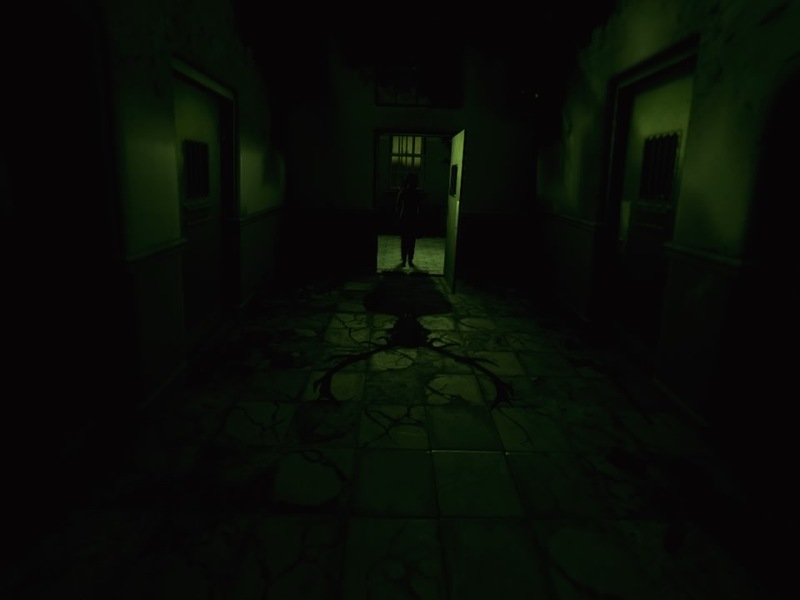 I had fairly high hopes for The Inpatient, but it just simply fails to deliver a solid VR horror experience. the inpatient WAS PURCHASED BY THE REVIEWER. ALL SCREENSHOTS WERE TAKEN ON PS4 via the psvr headset. Please note that all screenshots were taken directly from captures via the PSVR headset and appear far darker than how it appears in game. I wanted to use actual screenshots and NOT press given screenshots that do not reflect the experience you have while playing the game.